September 20, 2017 marks 22 years that Premier Building Systems has been in business. We started out as a couple of sales guys who wanted to take our experience in the steel buildings business and use it to build a new business that met our standards of quality. (OK. We wanted to make money at it too!) But we had no idea it would last this long and grow this big. Premier now has put up thousands of buildings that are scattered across the entire continental United States. We have seen our country and our business go through enormous changes. It seemed like a big milestone when we moved into our first real office in Lawrenceville, GA, a building that we put up ourselves. 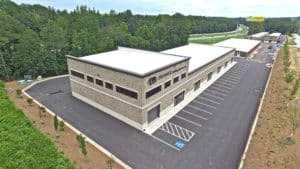 Then, in May of this year, we moved into a newer, larger building in Braselton, GA, also built by us. It’s been a long and wonderful trip so far. And we look forward to serving our customers for many years to come. Delivering satisfaction to them makes it fun and worthwhile. We owe a big “Thank You!” to our customers for making it all possible. Let’s make the next years as great as the last twenty-two! THE MORE YOU LOOK, THE BETTER WE LOOK!